On toilet doors you sometimes see fancy graphics, stylized versions of the little dude and chick that tell us which little room to go in to do our business. 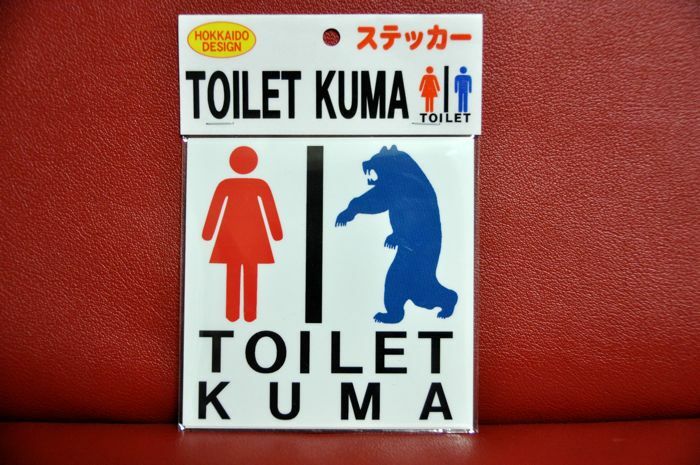 I’ve seen Picasso-esque renderings, melting-egg Dali versions, manga characters, the oft-confusing-to-illiterate-gaijin kanji versions, but never before one where the dude is not a dude but a bear. Only in Hokkaido. This sticker was omiyage (souvenir gift) from a friend who went there for a holiday. Kuma means bear.